For the first time in decades, a version of the rugby sport will be played at the 2016 Summer Olympics to be held in Rio de Janeiro, Brazil. Despite being the world’s most popular sport, Rugby USA has an uphill climb to capture American hearts. When I first told my parents that I wanted to play Rugby, the response was less than enthusiastic. My mother thought that this was a violent and dangerous sport where I would break my body within the first day. My father thought I was joining a beer-league, (which was totally not true.) And when I told my girlfriends about my new venture, their reactions were not much better. “Ewww, you’re going to be all bruised and fat and hairy.” Some even worried that my sexual preferences would change. While I may have gotten some bruises, none of these predictions turned out correct. In fact, the one thing that rugby taught me is that I don’t need to let others define what it means to be a girl. On the Rugby Pitch I don’t worry about looking pretty when I am going in for a tackle. And even off the field I think of myself as an athlete, not a model. I don’t care that you can see cleat-shaped bruises decorating my legs below my prom dress. I work hard to keep my body fit for my sport, not my bikini. People think it’s perfectly acceptable for boys to play football, but why in the world would a girl play rugby? It takes a certain type of girl to disregard what society says is OK for a girl to do. Female ruggers are strong real girls who play the sport because they love it. There are countless benefits of playing Rugby. For example, there are the health benefits. Contrary to popular beliefs, there is more to rugby than bashing heads and injuring each other. Rugby requires a lot of lower and upper body strength. 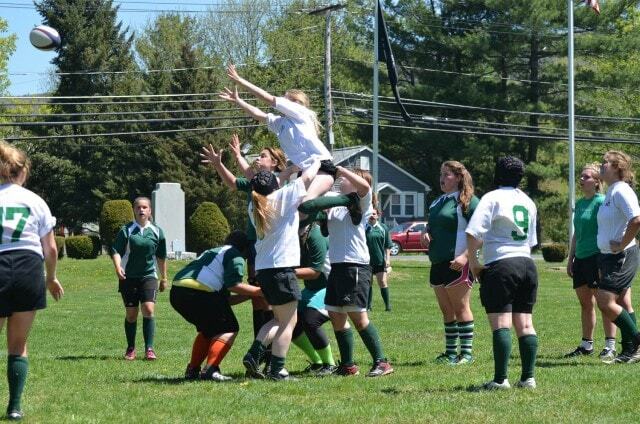 In addition to physical strength, rugby requires more teamwork than any other sport I know. You cannot just throw the ball forward, and ball carriers are constantly being tackled, so strong communication and teamwork are extremely important to keep the game going. As one of my team captains explained in an inspirational speech, each player on the pitch is a separate puzzle piece that has to fit together to create the puzzle that is rugby. Another great thing about rugby is that no matter what size you are, what kind of person you are, or how much experience you have, everyone is level on the pitch. 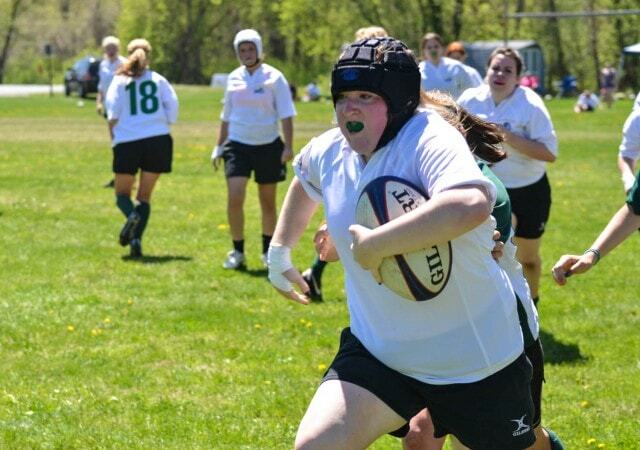 You don’t need to be the typical slim athlete to play rugby; there is a spot for every body type on the team. Often the heavier set girls with strong upper body strength are put as forwards, and the girls who can run faster are put as backs. However, this is definitely not a rule. Some very good forwards can be smaller girls, and there are often great backs that are bigger. As for personality types, you really can’t stereotype female ruggers, because many different kinds of girls come together and become a family. Through rugby I met girls who I would never had befriended otherwise, and I learned to be more accepting of different sexualities and different types of people. So why should a girl play rugby? A better question is: why not? With all the physical and emotional benefits of rugby for women, the only downside is the fear that you will be any less of a girl. However, a confident girl wouldn’t let society rule her decisions. What is this Rugby Sport? If you’re from the United States where Rugby isn’t a popular sport as it is in the rest of the world, you may be wondering what is this rugby sport? In short, rugby is: 30 players fighting over a ball for 80 minutes. Although the game is far more complex than that, it is really difficult to actually understand until you’ve played it. To get an idea of how this sport is played, take a look at this rugby guide video: A Guide to Learning About Rugby. Or check out this multi-page guide from Sports Fitness Advisor on rugby training that is packed with practical tips and advice. Rucks: After someone tackles somebody else, each team tries to “ruck” over the ball. This involves pushing over the ball so that their team can get to it, kind of like a scrum. Usually forwards ruck while the backs try to set up a line, however anyone on the field can ruck. Scrum: Certain penalties will cause the referee to award a scrum to the team that did not cause the penalty. The forwards from each team will assemble in a formation like in the video, and the non-offending team’s scrum half will throw the ball into the middle of the scrum. Both teams will try to push and claw the ball to their side. Lineout: When the ball goes out of bounds on the sideline, the teams will line up. The non-offending team will throw the ball in and each team will try to hoist their “jumper” in the air to catch the ball. Knock on: The ball is always thrown backwards and to the side, never forwards. If the ball is accidently thrown or dropped and picked up forwards than this violation is called a knock on. High tackle: Another violation is a high tackle in which a player tackles another player above the waist. This can be dangerous. Try: To score a try is the object of the game and each try is 5 points. In order to score this, a player must plant the ball on the other side of the try line. Forwards: Players 1-8 are forwards. These are the strong bunch that participates in scrums and the majority of rucks. Backs: Players 9-15 are the fast runners who set up offensive lines and try to run the ball down the field. Defensive/Offensive line: When on defense (the other team has the ball) the object is to set up a defensive line that is flat across the field and to then charge at and tackle the ball carrier on the opposite team. When your team has the ball and the players are on offense, the backs try to set up a diagonal line. Since players cannot throw the ball forward, they pass the ball backwards along the diagonal line. Offsides: The rules of offside are extremely confusing, and I wont try to mix you up. Try reading Wikipedia’s definition. The numbers on everyone’s back actually correspond with their position. Numbers 1-8 are all forwards and 9-15 are all backs. For example, I play wing, which is a back position and my number is always either 11 or 14. You can’t just tackle anyone on the field. You can only tackle the ball carrier. When you are tackled you cannot throw the ball from the ground, you must set it. However while you are being tackled you may throw the ball if it is a continuation of action that you started before. 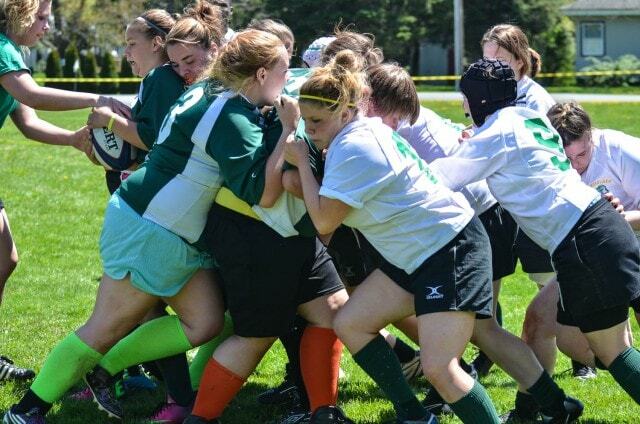 Fun fact: People always ask if girl’s rugby is played differently? Well its not. It’s the same game. Where to find a Rugby Team? If you are in the New York’s Capital Region, CDYR lists several teams in: Albany, Berkshire, Kingston, Saratoga, Schenectady, Sothern Tiers, and (GO DRAGONS!) Rensselaer. Each of these teams is linked to on the CDYR site, and contact information for the coaches is there. Teams are always happy to recruit new players so don’t be scared to send them an email. 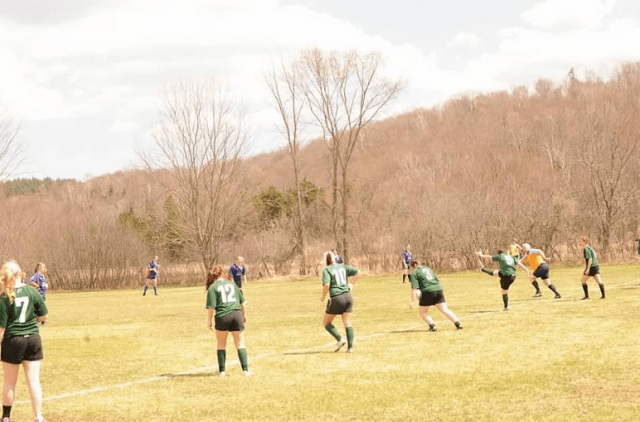 They play 15’s Rugby in the spring, and many of the teams also play 7’s in the summer, which is similar to normal rugby but played in 7-minute halves, with 7 players per team. CDYR also has a Rookie Rugby team for grades 1-8, which is NON CONTACT. That means touch rugby, with no tackling. Moms, this is just as safe as soccer! If you reside elsewhere in New York, Rugby NY has a map of all the teams in our state. Where to see Rugby in action? The easiest place to watch the rugby sport is on TV. Channels where you can catch a game include: NBC sports and Fox soccer plus. Locally, you can follow the team links on USA Rugby for area schedules; most teams welcome spectators. Look forward to seeing rugby in the World Cup in Paris in 2014, and the Olympics in Rio in 2016! 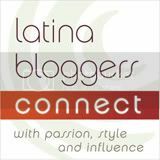 Kayla Foyt | Kayla Foyt is a ski racer, skim boarder, runner, fashionista, and teen trend setter who thinks the best stuff is FREE. Fashion tip: brighten your ski gear with neon duct tape, and get your skim on with a colorfully painted and protected face of zinc oxide.